I do! 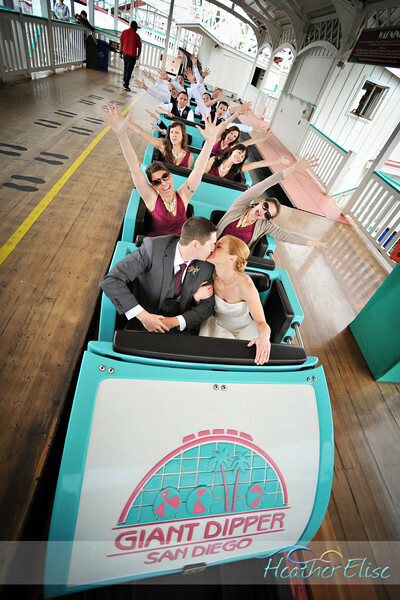 …and then they rode the Roller Coaster! Steph and Paul claim they have more fun than anyone. 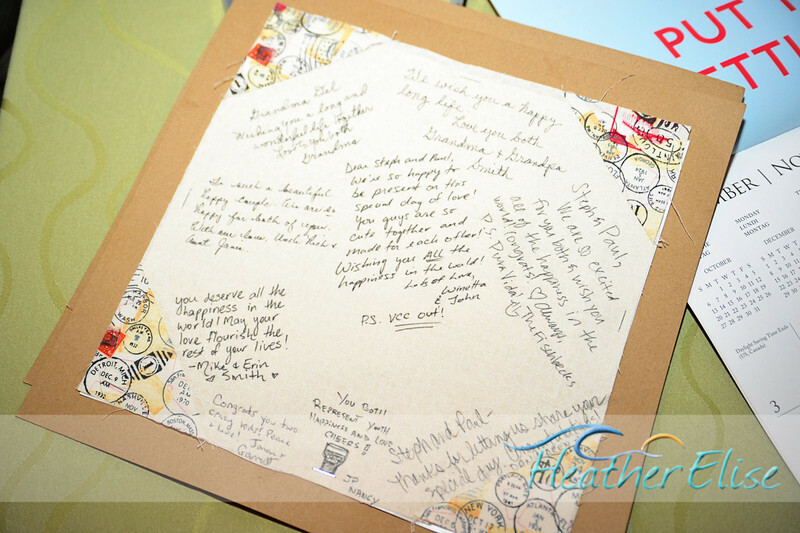 And their April wedding in San Diego proved just that! 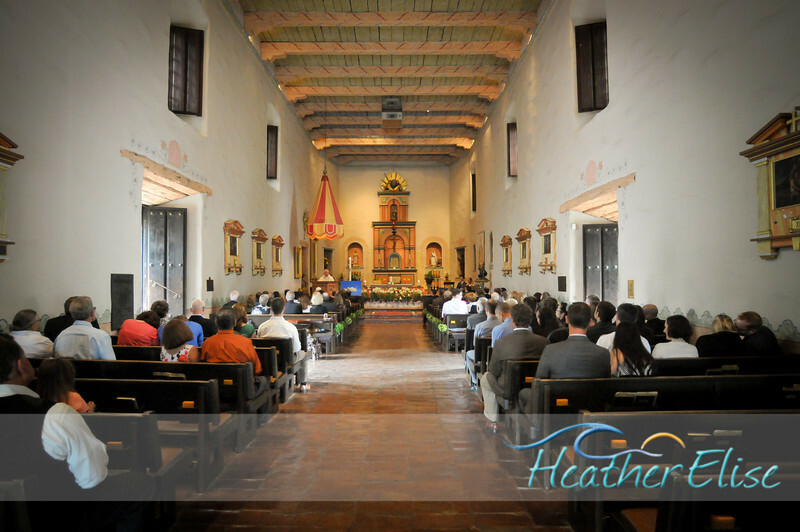 The day started with a traditional Catholic wedding ceremony at the historic Mission Basilica San Diego de Alcala. 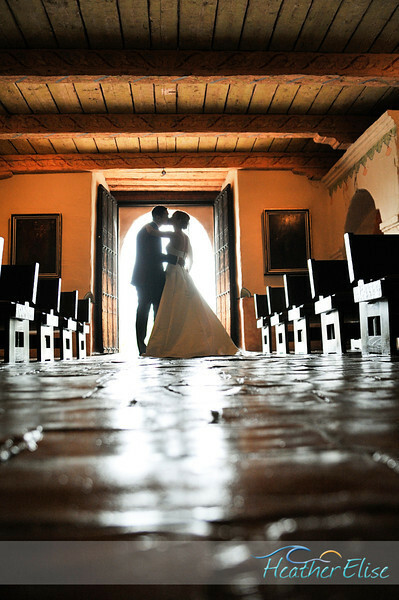 It was a special location, as the bride’s parents were married in the same church 35 years earlier. 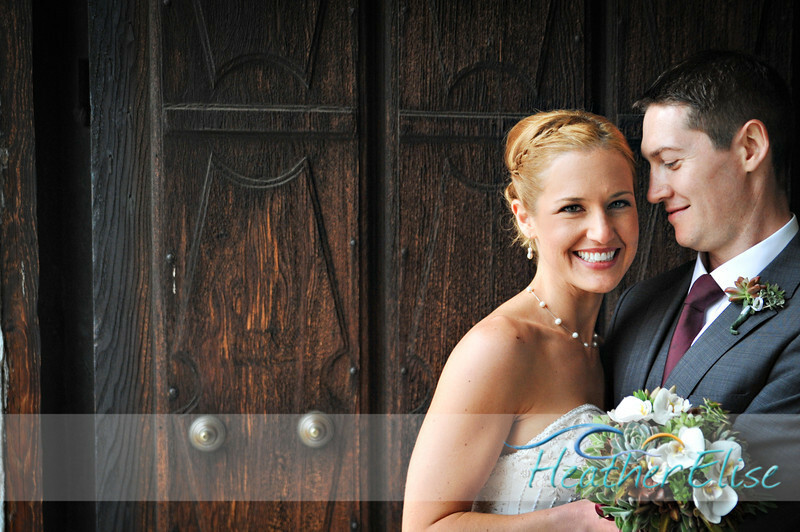 All of the personal flowers, bouquets and boutonnieres, were created by the bride’s talented aunt. 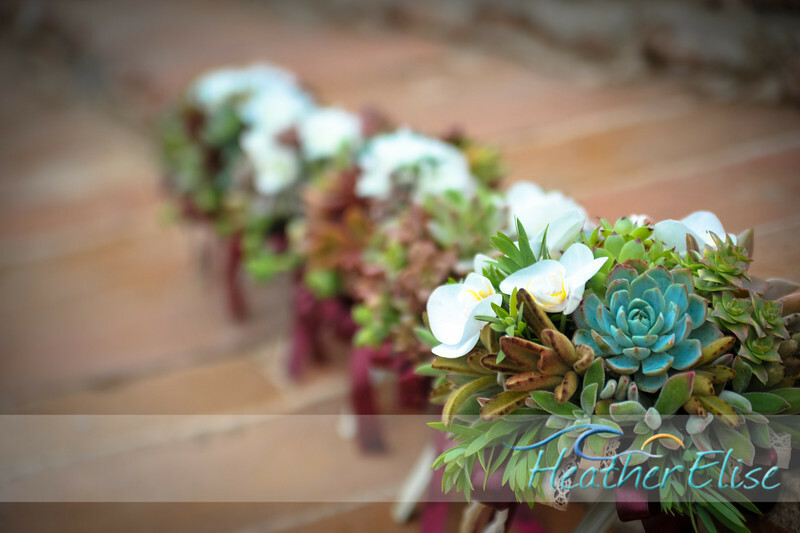 Steph selected succulents for their cool colors and textures and as a green alternative to cut flowers. All of the bouquets have since been planted in the yards of family and friends as a remembrance of the special day. 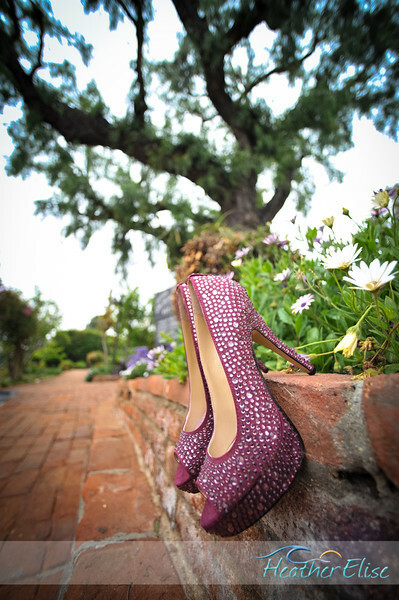 The bride wore dazzling hot pink shoes as all fun-loving, vivacious brides should! 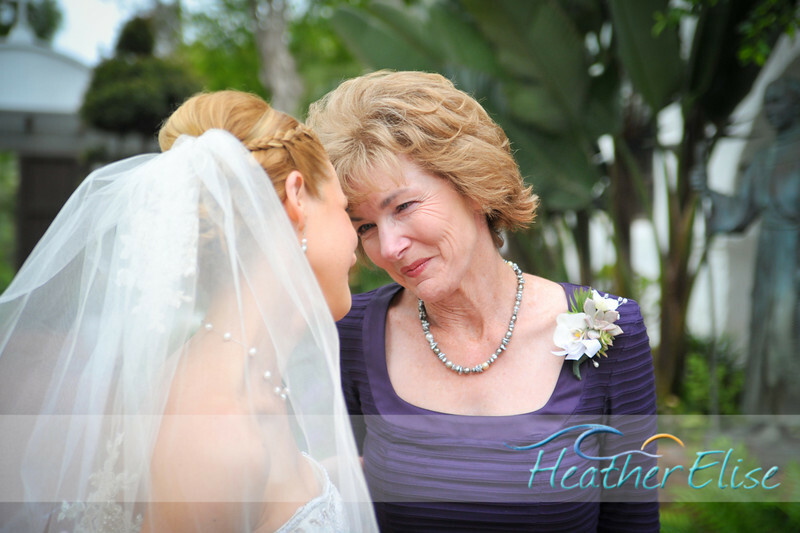 The photos, captured by Heather Elise of Heather Elise Photography were stunning and really captured the joy and love present that day. 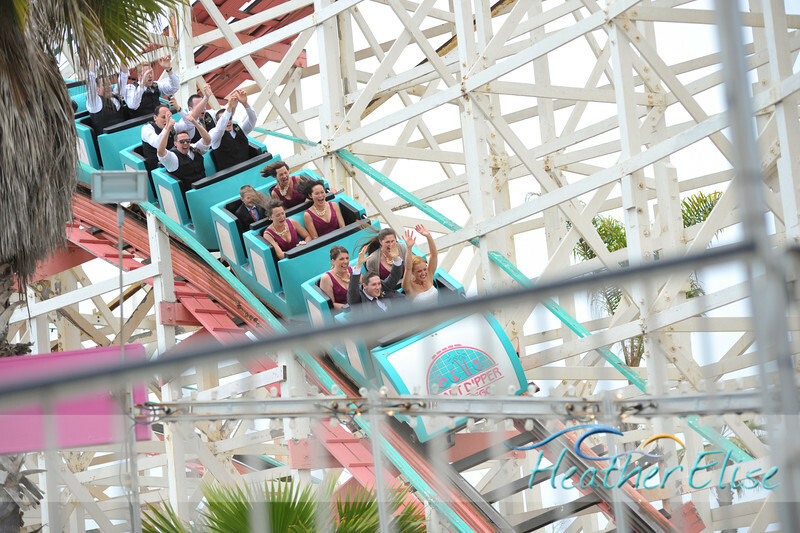 Once the ceremony was complete, the entire wedding party took to Mission Beach to ride the iconic Giant Dipper Roller Coaster! 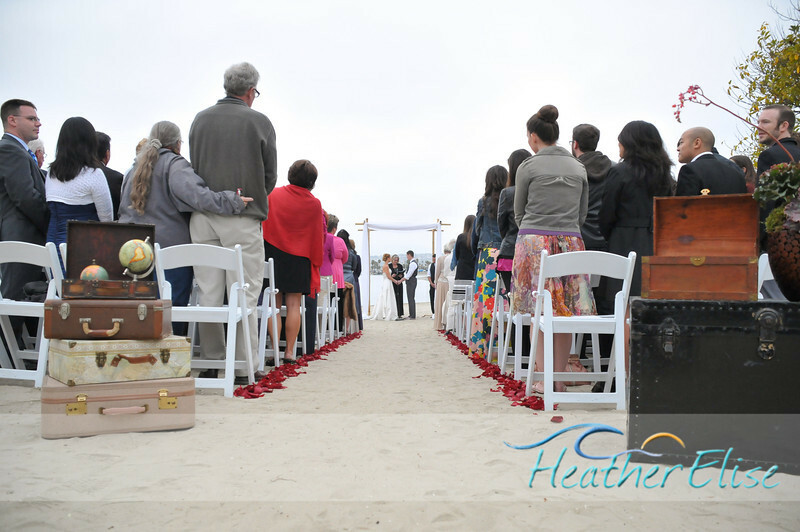 Next, the couple had a special Ceremony of Love on the private beach at the Bahia Hotel. 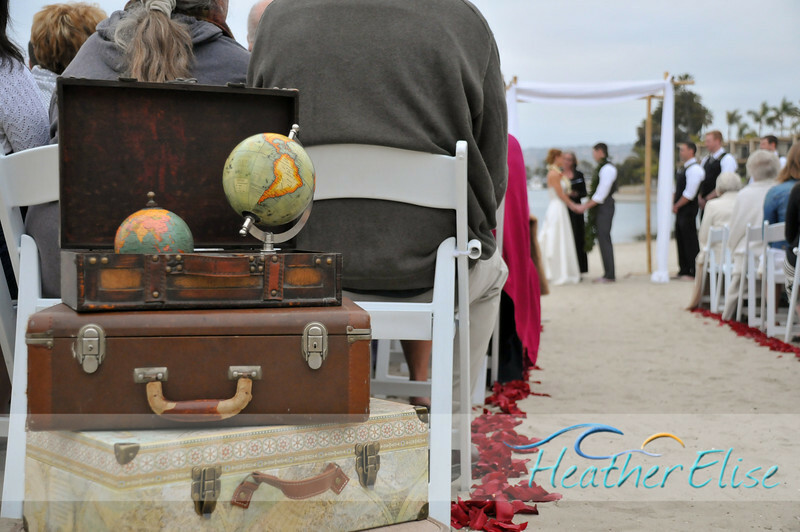 This ceremony celebrated wedding customs from around the world, as Steph and Paul have travelled extensively and lived internationally. 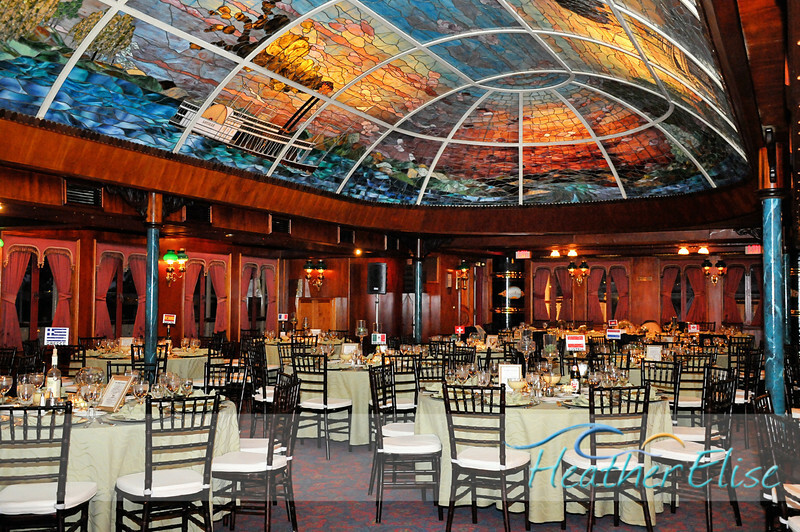 Travel-themed decor greeted the 170 guests who had travelled from across the world to celebrate with them. 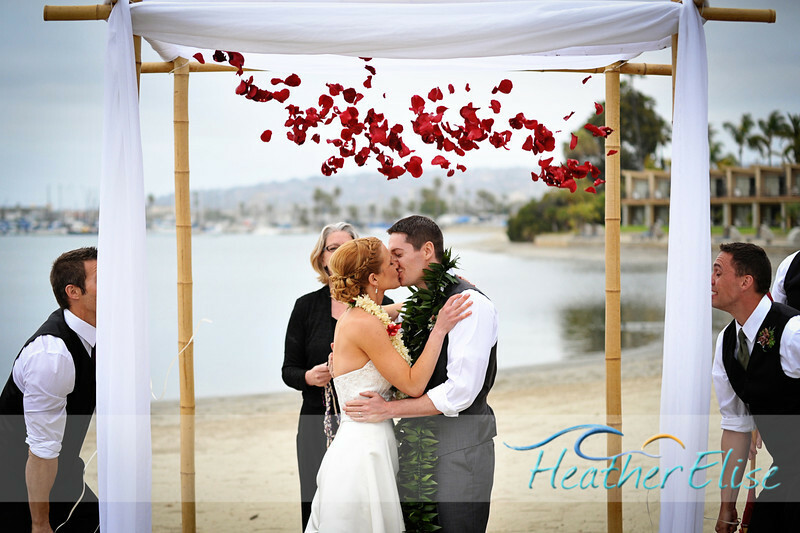 A custom petal drop was created so the rose petals were released for the couple’s first kiss. 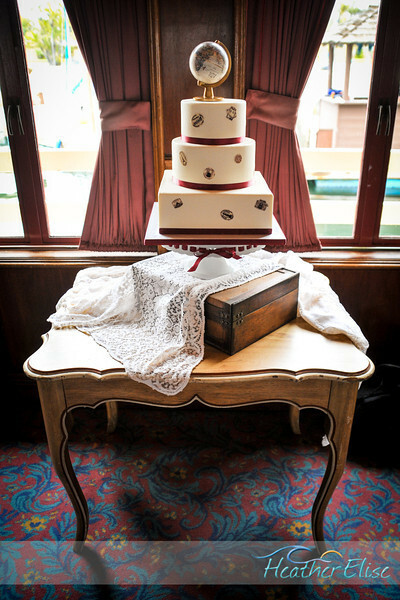 After the beach ceremony, the guests were treated to a party on board the William D. Evans sternwheeler. 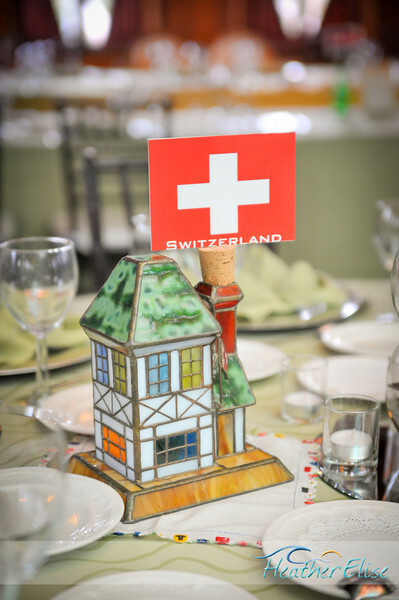 Each dinner table was named for a country the couple had visited and included framed wedding customs from that country. 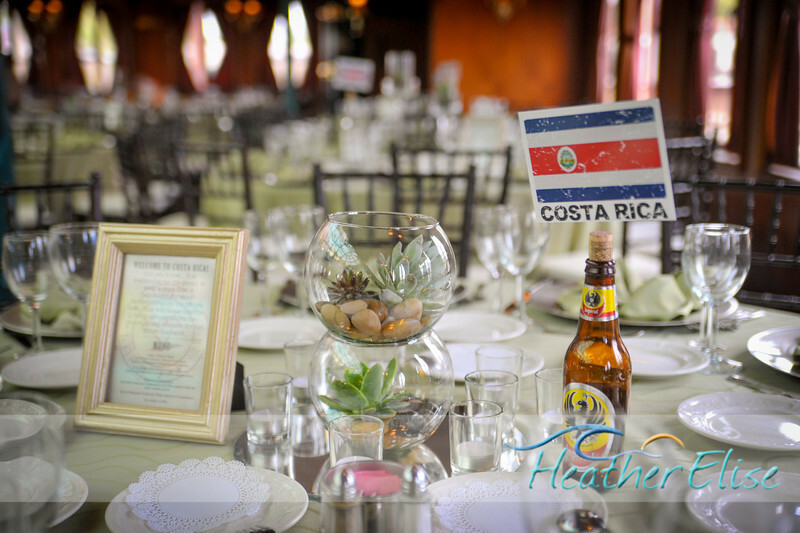 Bottles of wine or beer from the countries held postcard sized flags to indicate the table name. The cake was covered with passport stamps to continue the travel theme. The knife used to cut the cake was a family heirloom and the lace tablecloth on the cake table belonged to the bride’s grandmother. 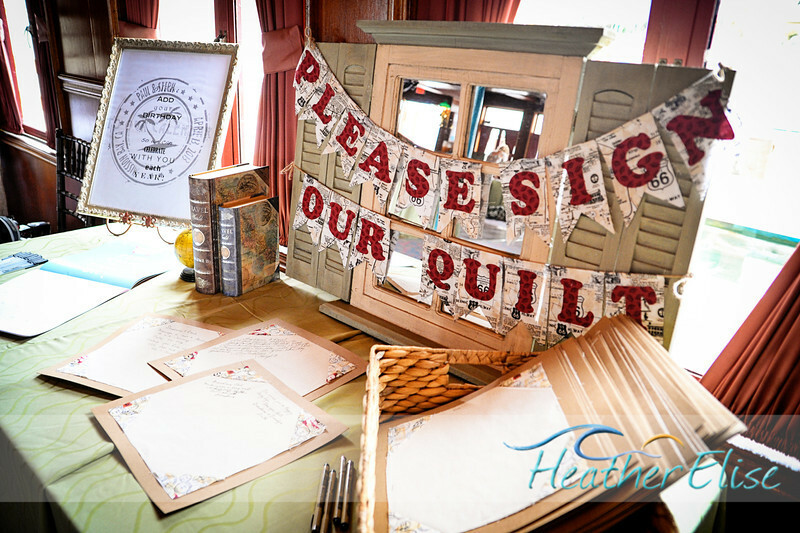 The guestbook was a quilt lovingly created by the bride’s mother. The guests danced for hours to the music played by San Diego DJ & Video. Truly a fun day filled with family and friends. Congratulations to Steph and Paul!